Location: Póvoa e Meadas, Alentejo. Grid Reference: 39° 24' 36" N 7° 23' 15" W.
Menhir da Meada: (Standing Stone). Located in the Alentejo, 10 km north of Castelo de Vide, in the Portalegre district. 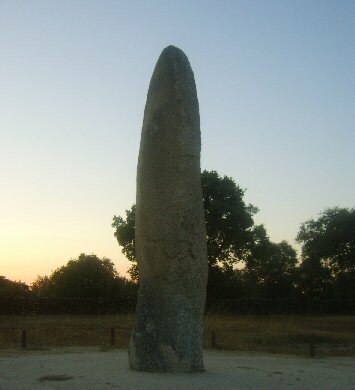 This menhir, the largest in the Iberian Peninsula, stands just over 7m high with a 1.25m girth and illustrates the importance of the area in prehistoric times. 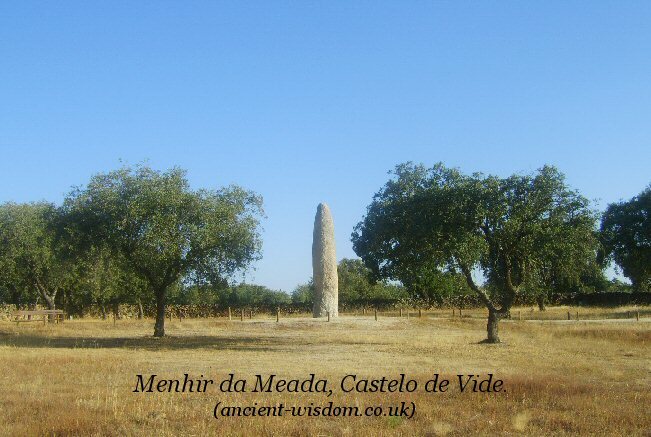 Apparently its height is due to the fact that it belongs to a line of menhir's which were carefully arranged so that each one was visible from the next (The Menhir of Meada stands in a lower elevation than the others) (1). The same region (Castelo de Vide), also offers over 50 megalithic remains, and lies close to the Extremadora region of Spain, which also offers a high concentration of megaliths. The profile of the hills at Valencia de Alcántara (Spain), when observed from the large menhir at Póvoa e Meada, cover the azimuth range (85º-110º), relevant for the Spring Moon/Sun crossover observation, suggesting a spring-Moon relevant landscape profile in the Alentejo region. (2). The importance of the landscape becomes obvious when standing beside the menhir which has (or could have), an almost 360° view of the surrounding landscape. 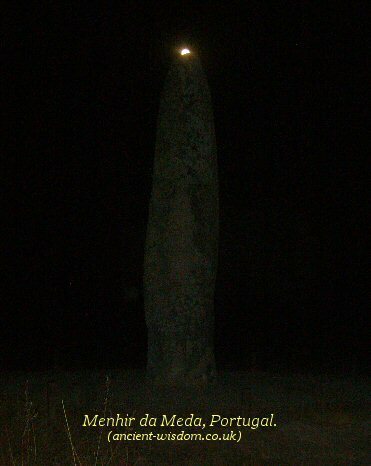 The full moon illuminating the tip of the menhir.